Halloween is a fun Holiday for the family. Ghosts, witches, fairies and an array of other costumes are everywhere. Decorations, going Trick-or-Treating, food, parties and friends. 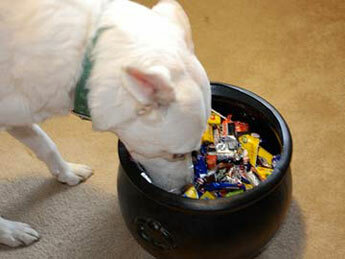 However, Halloween can be a nightmare for your dogs; it might even be THE most dangerous holiday. Dogs don’t understand costumes. The changes in the way a person walks, stands or their general appearance may cause a dog to react differently even with those they know. Oddly dressed squealing kids and strangers ringing the doorbell can cause unnecessary stress to your dog. Send him to bed early in a safe room away from the doorbell and outdoor commotion. Leave a radio, television or other sound source on at a level that will mask the scary noises. 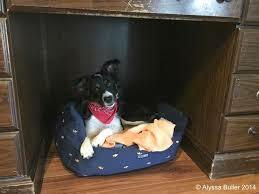 Give him a yummy bone or special frozen stuffed Kong to keep him entertained and displace the anxiety. 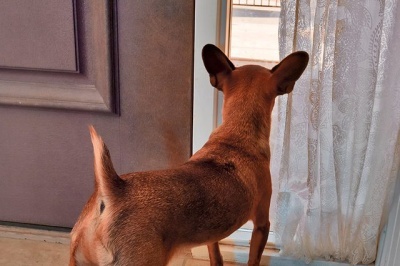 If your dog barks at the doorbell, disconnect it. 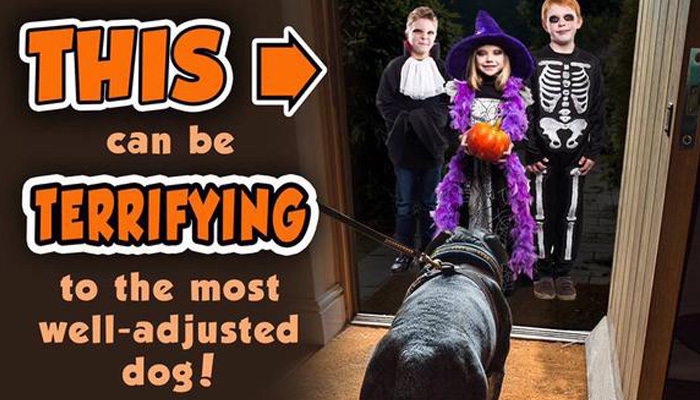 Watch for trick-or-treaters and open the door before they knock. Be on the alert for candy wrappers, chocolate and other candy. Place electrical cords and decorations out of the way and don’t leave candles in pumpkins unattended. Don’t leave your dog around kids without supervision. The erratic movements and loud, startling noises can really upset him. Add in a scary costume and you have a formula for disaster. Don’t leave your dog outside. Even if you have a fenced yard, bring your dog inside where it is safe. He may be used to strangers, but so many little ghouls and goblins running about may be too much. 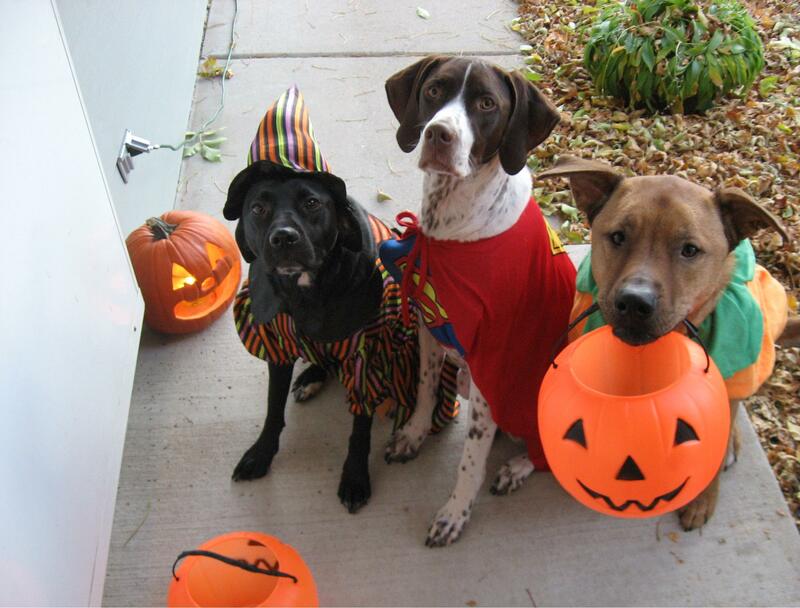 Remember, it is a natural instinct for dogs to protect the family from strangers, and on Halloween there will be no shortage of strangers. 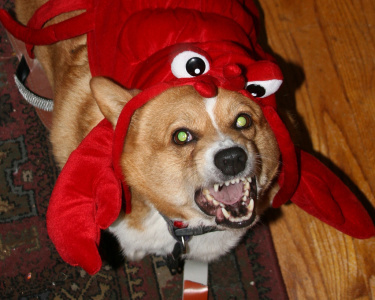 Have your dog get used to costumes. Your dog may see his family members as strangers once they don their Halloween costumes. Before the kids put them on, allow your dog to smell the costumes. If your costume has a mask, keep the mask off when you are with your dog because dogs can become confused when they can’t see our faces. Check your dog’s ID tag. 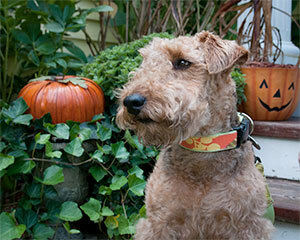 Be sure identification tags are secure on your dog’s collar-just in case. 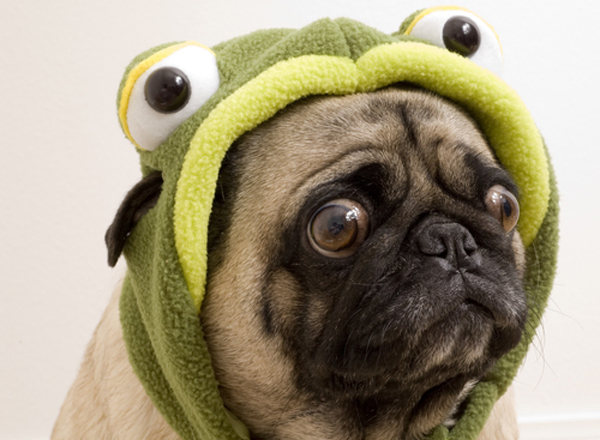 Think twice about dressing your dog in a costume. While some dogs might enjoy being dressed up, many don’t. 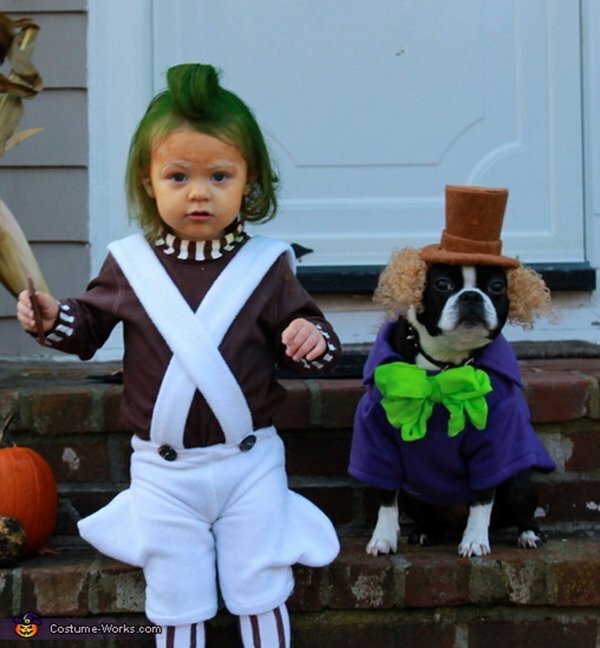 First see if your dog likes being in a costume. If so, fine-he’ll most likely enjoy himself and the extra attention it brings. However, if he shows any resistance, don’t do it. Dogs feel enough stress around Halloween without also having to endure the discomfort and peculiarity of wearing a strange costume. 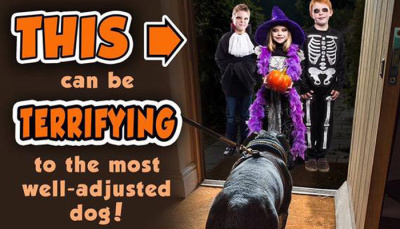 Finally, if you want your dog to be included in Halloween festivities, think about his safety much as you would the safety of a small child. 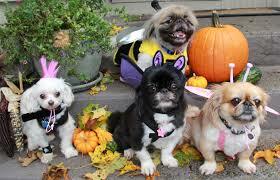 Your dog does not understand Halloween, so he needs you to provide the guidance and safety that you always do. Enjoy the fun of this action-filled night. 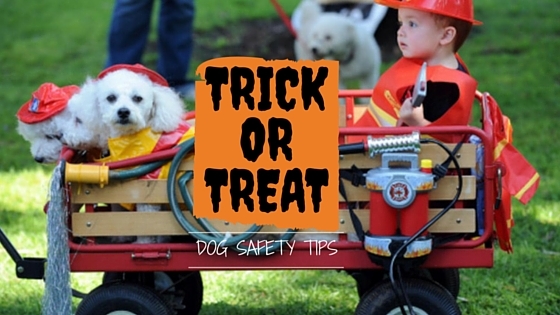 Remembering to take extra precautions to keep your dog safe will make a better celebration for the whole family. Simple Tips to Help Your Dog Lose Those Holiday Pounds! Start building a better communication and relationship with your dog!